Hanami Sachets, a photo by Ayala Moriel on Flickr. It only took me 2 years from when I received these incredible fabrics (vintage kimono silk) from Japan, to actually making and filling them. They are hand-stitched (I still need to sew a few more), so very labour intense - a labour of love, if you will. But that's not the true reason for my procrastination. I just did not know what to fill them with! The solution was partly serendipity, and partly luck. On my last day in Berkeley, I visited Yuko Fukami. She generously gifted me with high-quality Japanese herbs, spices and resins that she in turn received from our mutual friend Ross Urrere. 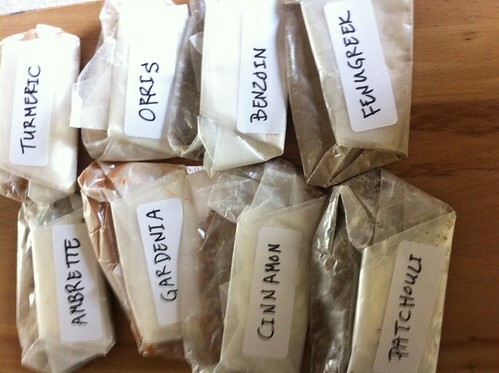 In true Japanese fashion, she beautifully wrapped them with wax-paper, similar to how a TCM (Traditional Chinese Medicine) doctor packages his custom-dosed powdered "herbs" (for all I know, these can range from true herbs and plant matter to minerals and crushed sea-horses, tiger bones, dragon's tails and other mythical creatures body parts). Upon my return to Vancouver, I immediately set to mix together these glorious components, as well as some of my own stashed-away botanicals: dried ume (Japanese sour plum) blossoms, whole tonka beans, and others that for now will remain secret. 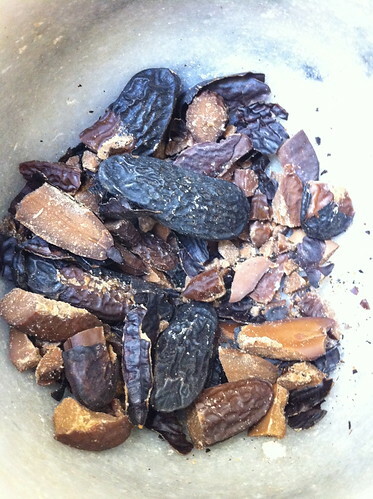 Crushing the tonka beans with a marble set of mortar-and-pestle was a truly sensual experience. Although there is mostly coumarin in tonka, there is also something else that is nutty and spectacular that you just don't get from the isolate/synthetic molecule alone. I love it! French chefs grate it on microplane and add to chocolate desserts (ganaches, macarons, ice-creams...). In North America it is illegal to use it due to carcinogenic effects. Personally, I think that we are exposed to far more dangerous carcinogens in daily life (your seemingly innocent ink on your grocery receipts has a plastic that is highly carcinogenic, as are most cans used to preserve foods). So I don't feel bad at all making myself a tonka-dessert once in a blue moon. 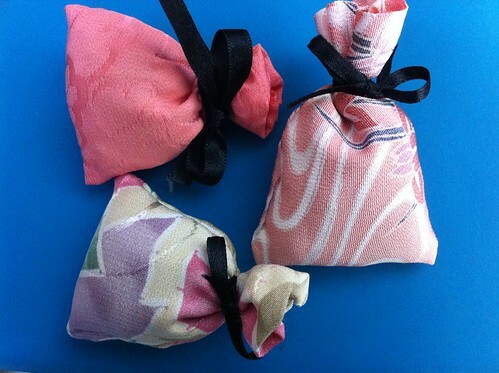 The sachets were supposed to be a studio-exclusive for my Hanami tea party. Unfortunately, we had to cancel it and will host it either in early May, or next year... So you can now get them online on my virtual boutique. These are very limited edition - I only have enough fabrics and filling for 12 sachets. The Japanese used incense and sachets just like that to scent their kimonos and stationary so that they will be recognized for their good taste by their lovers (or suiters)... Use these sachets to scent your lingerie drawer, linen closet or stationary. You can also throw it in your suitcase when traveling, or tuck into a wool sweater or jacket's pocket for a lingering scent and to keep moths at bay. Who said life on the West Coast is boring? Or scent-less? I spotted at least 4 events that are taking place within the next 4 weekends alone. Awaken your senses this spring with a modern and relaxed tea ceremony! We will welcome spring with elements that will engage all your senses and delight your soul: 4 hand-blended teas incorporating seasonal local plants, visually inspiring flower arrangements, soothing music, stunning jewellery by Japanese-Canadian designer Noriko Mahoney of Dancing Leaf Design, and of course - the most delightful spring perfumes by Ayala Moriel Parfums. The party is also a special opportunity to celebrate the new packaging launched for the brand's 12th anniversary; as well as limited edition Hanami sachets (hand-stitched from vintage silk kimonos), and two new soaps. Noriko and Ayala will be preparing delightful spring sweets and savoury appies inspired by our Japanese and Middle Eastern heritage. For more details, including menu, visit our event page or newsletter. This event is limited to only 20 people, 10 are already taken - so please RSVP early! Northwest Perfumers Circuit at Blackbird Apothecary in Ballard - hosted by Blooming Dream. Portland-based erfumer and landscaep architext Suzinn Weiss will present her new perfume created espeically for the shop -Blackbird Vert. Artisan Fragrance Salon is heading up to Seattle! MIKMOI, Artemisia Natural Perfume, Meshaz Natural Perfumes, Blooming Dream Natural Fragrance, Pirouette, Imaginary Authors, Sweet Anthem Handmade Perfumes, Olympic Orchids, Gabriel's Aunt, Rebel & Mercury, House of Matriarch, Jolie Laide Perfume, Coeur d'Esprit Natural Perfumes, and Roxana Illuminated Perfume. Great opportunity to meet with perfumers and creators face-to-face and make new perfumista friends! Get your tickets in advance and save. Registration is limited to about 45 people, and half is already sold out already. 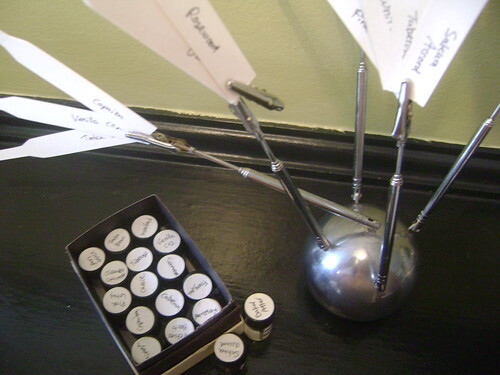 Northwest Perfumers Circuit at Blackbird Apothecary - hosted by Ayala Moriel Parfums. Join us for an evening of aromatic tonics and fragrant truffles to celebrate the new scent Ayala Moriel designed for Blackbird Apothecary. More details TBA - the scent is, for now, a secret...! 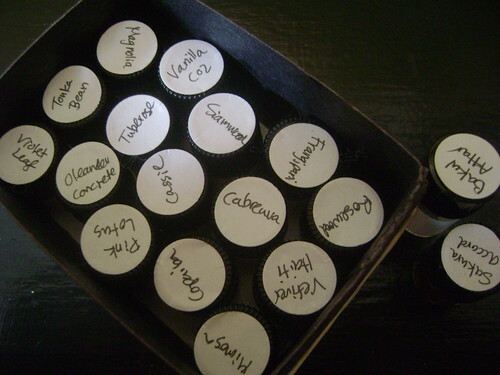 Hanami Perfume Building Blocks, originally uploaded by Ayala Moriel. There is much written about Hanami in my original notes published on Memory & Desire blog. The presentation at the Hanami Tea Party yesterday was pretty much the same as I did at Blunda in Los Angeles last April as part of the Natural Botanical Perfume Exhibitions, sans the big banner with my photograph of the sakura floating on water, and with different audience of course. Hanami Perfume Raw Materials, originally uploaded by Ayala Moriel. The focus was more on the materials themselves, and we went deeper into talking about each note, sharing impressions, and me explaining a bit about each raw material. Bakul attar: Traditional Indian attar, bakul tree flowers are distilled into a base (carrier) of sandalwood oil. This attar smells mostly of sandalwood to me. Vetiver from Haiti: Essential oil of rootlets from this tropical grass. The Haitian variety has a very light, almost citrusy and tart character. It feels more moist or wet than others. Siamwood: Hardwood that is used to make coffins... Has a very similar scent to Himalayan cedarwood - transparent, clean, ethereal. Cabreuva: Hardwood from South America. Used for making furniture. Extremely hard and has a scent that is flowery and mostly water-like. Copaiba Balsam: Steam distilled from this South American balsam (pathological secretion from a tree or a shrub), it has a very light vanillic note, yet more on the dry clean and slightly watery side. It's a top note but possesses incredible fixative qualities. Tonka Bean: High coumarin content from these beans that grow on this South American legume tree is what gives it its distinct almond bark, caramel and vanilla odour. One of the best fixaties as well and is what gives the "sakura accord" its cherry-like bittersweetness. Vanilla CO2: Molecular distillation from vanilla beans gives a milder character, sweeter and less dark in both appearance and scent. It has less of the woodsy character of vanilla absolute as well. Cassie Absolute: A type of mimosa, with wet woods, violet and leathery nuances. Really gives Hanami its metallic urban edge. Violet Leaf Absolute: Like cucumber, crushed leaves and powder. Another contributer to the cool "wetness" of Hanami. Pink Lotus: Dark and sweet, exotic, narcotic floral with some of animalic decaying murkiness of the water where it grows (it has to be harvested while immersing in them!) and a little powdery too. Magnolia (White): Tree native to Asia and we see a lot of it here in Vancouver in white and in different shades of pink. The white magnolia is fruity, light and peachy. It gives the Sakura accord its lightheartedness and the sweet gourmand feel. Oleander: Subtle and powdery as well. It's from a plant native to the Mediterranean region, where it grows mostly in stream and river banks. The branches and leaves exude a poisonous milk-like substance when broken off. It works as part of the heart notes in Hanami, giving it a soft oily-woody and pollen-like character along with the frangipanni and mimosa. Tuberose: There is a lot to be said about tuberose, one of the most alluring floral notes in perfumery. This flower is related to narcissus, native to Mexico, and intensifies after it is picked, and releases more scent after nightfall. The scent can range between powdery and even a little green, to buttery and milky and all the way to intensely heady and even with medicinal camphoreous and with a lot of wintergreen-like(from methyl salicylate) notes. I used one that is soft and creamy as part of the sakura accord as well. Frangipanni: Also known as plumeria. This tropical flower has a nectar like scent in real life. The absolute is more on the creamy, powdery and oily side. 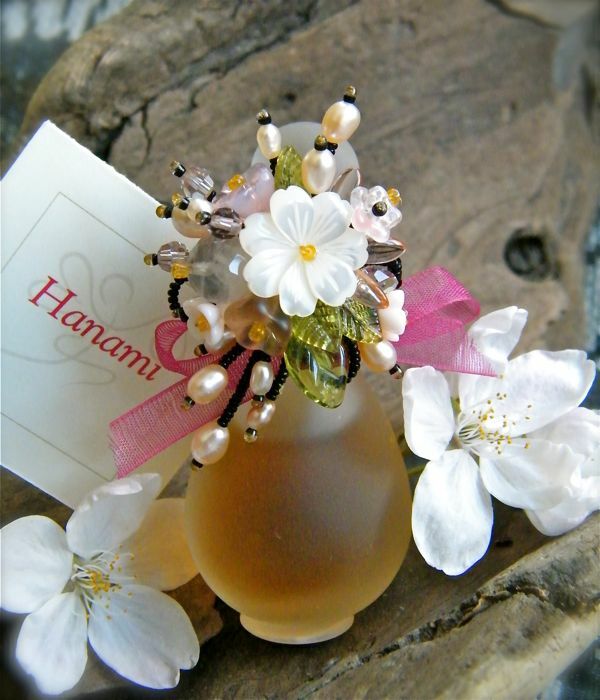 It gives Hanami an almost aldehydic softness and a little bit of green quality as well. Mimosa: Flower that grows on bushes from the legume family, native to Australia but has become an invasive species in Europe and the Middle East. It has a light, cucumbery, powdery, watery-woody character. Gives these wet wood qualities at the top notes for Hanami, and also gives it a nice floral top note, with that pollen-filled air touch. Rosewood: Another South American hardwood, native to Brazil. Use to make furniture and jewelry boxes, etc. It has a lot of linalol in it, which gives it its floral (supposedly rosy) woody character. It gives any perfume a lift and in Hanami it's another layer in the floral-woody theme that is recurring throughout the different layers - top, heart, base. 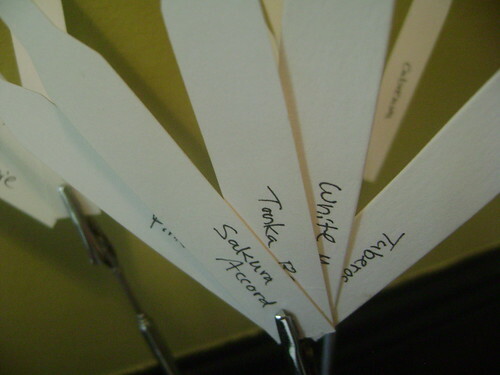 Touches (scent strips) with Sakura accord, originally uploaded by Ayala Moriel. The guests also experimented with combining scent strips of different materials together to experience the separate accords the make Hanami what it is. We built the perfume base to top with the metallic wet wood urban base accord (Haitian vetiver - cassie absolute - siamwood - Bakul attar); the sakura accord at the heart (tuberose - magnolia - pink lotus - tonka bean) and the other heart notes and top notes that make Hanami the unique creature that it is, layering petals and pollen over wet woods and metallic cement landscapes to create something that smells like sakuramochi and ume blossoms in Vancouver. Sakura & Highrise, originally uploaded by Ayala Moriel. It's all part of my world now. Memories from two years ago when I created Hanami and worn it for the first time under the cherry blossoms an the rain that went on and on for almost two months (because it got really cold in the middle of the spring, which curiously preserved the blossoms), and than last year again, reminiscing about it in the first heat wave of the year in LA. I hope this year Hanami perfume will turn to symbolize for me not giving up on beauty and perfume in particular, even when facing less than agreeable situations. I guess for me this perfume has become my internal samurai warrior that fights anguish whenever it sees it. Even if it turns it a little melancholy inside... It just makes it more beautiful and have more depth. Spring Welcoming Tea Ceremony, originally uploaded by Ayala Moriel. In this very modern and laid-back tea ceremony, I have incorporated botanical symbolism from a few cultures to create a modern tea celebration to welcome spring. The botanical symbolism was also included in the flower arrangement. The centerpiece at the tea table was this 4 piece bouquet of cherry blossoms, hyacinths, sprouted wheat and white magnolia. Spring Botanical Symbolism, originally uploaded by Ayala Moriel. 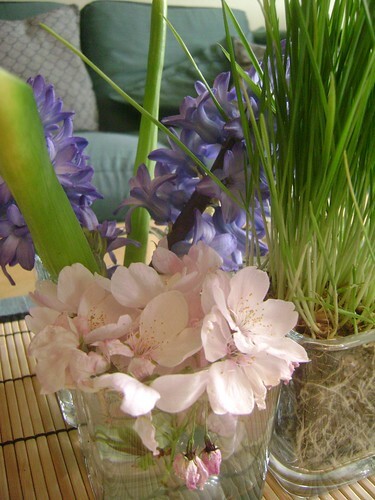 Hyacinths (sonbol - سنبل)and sprouted wheat (sabzeh - سب) are both part of the "Haft Sin" - the 7 S's in Persian botanical symbolism for new year, which occurs every year on the day of the Vernal Equinox. The hyacinths symbolize spring, and the sprouted wheat symbolizes rebirth. Some of the other symbols are a wheat-germ pudding, garlic, sumac, apples and vinegar and coins (read more here), all to invite different blessings into the new year. Magnolias were chosen simply because they are in season. In the European language of flowers magnolia means nobility and love of nature. I think the love of nature in this celebration is quite self evident! Sakura (Japanese for Cherry blossoms) are a symbolic flower in Japan. 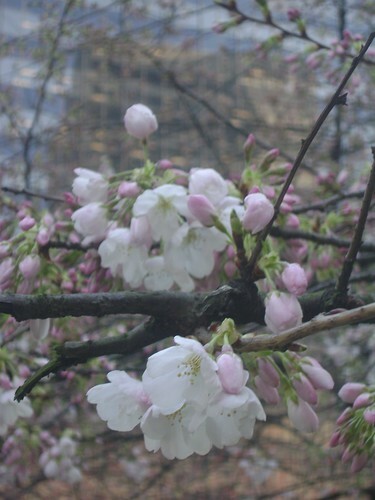 Cherry blossoms and tree blossoms in general mark the return of spring. It is the happiest time for Japanese people as they celebrate the beauty of the trees in full bloom (the peak of which lasts only but several days), and even appreciate the beauty of the petal's falling down like snow... Sakura's beauty is intense and short-lived, and it is spiritually symbolic of the samurai warrior's short life: the samurai will sacrifice his life at any time to serve and protect his master, and lives a short but fulfilled life. Sakura symbols are incorporated into numerous family crests and also in the Japanese, and is Japan's national flower. Interestingly, in Israel, there is a celebration surrounding the blossoming of the almond trees (also from the same family as cherry and plum). It occurs a lot earlier - usually sometime in late January to mid February. It is called Tu BiShvat and is considered the "New Year of the Trees". It is the best time to plant trees, and this is what the whole holiday is about. Other traditions include eating dried and fresh tree fruit, and most commonly - fruit salad containing dried fruits, almonds and nuts. The Kabbalists also celebrate Tu BiShvat with a "Seder" - a seasonal ritual incorporating different blessings, prayers and symbolic foods. The Seder of Tu BiShvat, similarly to that of Passover, calls for drinking 4 glasses of wine. However, instead of them being all red (as in Passover), each glass of wine is a different colour, to symbolize the four seasons, the four elements, and the four worlds of Kabbalah (that would be too esoteric to get into now); as well as the changing of colours of the flowers in the region from fall through late spring: in the beginning of the year (which for the Jewish faith begins in the fall), wild flowers are all white (Chaztav in September). Therefore, the first glass of wine is all white. Next come lightly coloured flowers (i.e. : Cyclamen and Karmelit during the winter), so the second cup is white wine mixed with a few drops of red; The third cup is the other way - red with a little bit of white wine; and lastly, the fourth cup of wine is pure red wine, which reflects the colours of flowers at the peak of spring - red anemonies and poppies. I have decided to adopt the four cups concept, but use tea instead. I thought it would be neat to celebrate spring with the different phases of tea and how it's processed, from the most pure form of tea to the more fermented and oxidized etc. And I've also used some flowers in the process to make it even more fun and spring-like! The different degrees of oxidation of tea leaves also affect the theine levels (aka the caffeine that is found in tea). White tea has the least, green has more, oolong is somewhere in the middle and black tea, which undergoes the most oxidation, has the highest theine levels. 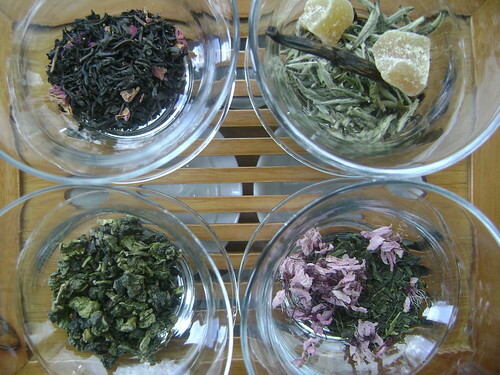 The white, green and oolong teas also have higher levels of anti-oxidants than black teas. White Teas, originally uploaded by Ayala Moriel. 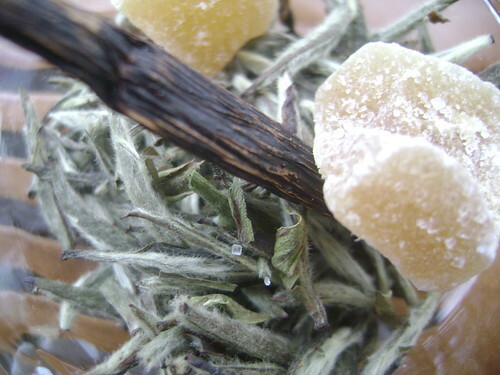 White tea is prepared from the first buds of tea leaves in early spring, and is the least processed of all teas. The buds are hand-picked, than steamed, slowly dried and does not undergo a process of oxidation like green and black teas. The result is the most delicate tea, the finest quality of which is called Silver Needle (Bai Hao Yinzhen), which you can see in the above photo and looks like needles covered in fine white silvery plume. The next grade is White Peony (Bai Mu Dan), which has the top bud and also the next two young leaves, which also have some of the same plume. Both are grown in Fujian province in China. Both produce a very light liquor and have a fine, delicate taste that I can only describe as slightly peppery. For our first cup of tea, I've used a blend of equal amounts of Silver Needle and White Peony, with a little bit of crystalized ginger and vanilla bean that I chopped up. Ume Sencha, originally uploaded by Ayala Moriel. Sencha is the purest green tea, and like white tea (and unlike Chinese green teas), is not roasted. Steaming prevents it from oxidizing, than rolled, dried and finally - fired in order to preserve them and give their distinct flavour. 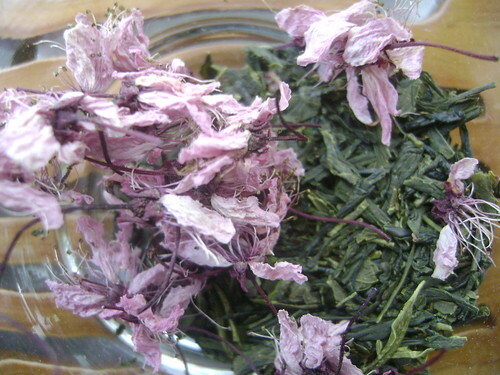 The result is a very fine, fresh and aromatic tea with a very vegetal and at times even seaweet like aroma. Other sencha tea leaves have a more nutty aroma, or in the case of the one I've picked (organically grown), a little fruity too (similar to peach or osmanthus). I blended it with ume (plum) blossoms, which I picked and dried myself during spring break in Victoria's Esquimalt neighbourhood. 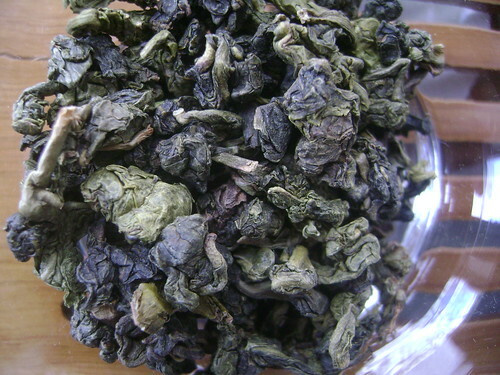 Magnolia Oolong, originally uploaded by Ayala Moriel. Oolong teas are like the champagne of teas. They are classified as somewhere in-between green and black tea (some are closer to green and some are closer to black). The best oolong teas grows in Taiwan or Fujian. The leaves are rolled into balls or longer curls. Many oolongs have a flowery aroma on their own. Some are further perfumed with flowers - such as this gorgeous magnolia scented oolong. Since the magnolias are out I thought it was a perfect occasion to brew this beautiful tea and share it with my guests. It is one of my favourite teas, and the more I get into teas, the more I discover how much I love oolongs in general. They are extremely different from one another and are just perfect on their own, with no sweeteners or any other flavours added. They are very rich in flavour, and are brewed rather concentrated, which gives off a bitter taste at first that turns very sweet aftertaste. They can also be re-steeped for many times (even as many as 7 with high quality oolongs!). Rose Congou, originally uploaded by Ayala Moriel. 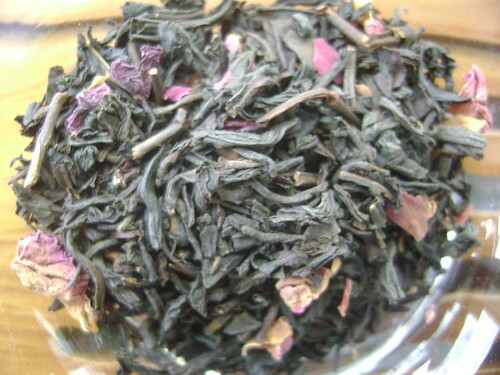 Rose Congou (or Gongfu) is a perfumed black tea that is formed into thin strips from unbroken tea leaves. It is oxidized with rose petals, which give off their sweet, fruity-floral aroma, and some of the rose petals are left with the tea for decoration. It gives off a liquor that is a little lighter than some other black teas, but is very rich in flavour.